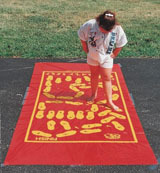 Your children will tumble for this mat as they try to follow the printed footsteps: heel to toe, side by side, forward, backward and even cross-over steps. Arrows point the way. Players who step out of sequence or fall down start over. Mat size: 135cm W x 240cm L.